If your future includes a move, check out our Kerman movers! Our professionally-trained student-athlete Meathead Movers, moving concierge, and Princess Packers are prepared to get you safely moved into your new Kerman home. Whether you’re moving to or from Kerman for a new opportunity, our professionally-trained student-athlete Kerman movers and our moving concierge service are here to help you with every stage of your move. Located in Central California, Kerman is a small community fueled by farms and agriculture. Called The Gateway to the West Side, this welcoming small town is located just fifteen miles west of Fresno. Those who are moving to Kerman will enjoy small-town hospitality along with all the conveniences of a big city. Like many small towns, Kerman boasts a wealth of events that everyone in the family can enjoy. The annual Harvest Festival celebrates the agricultural abundance of the area while providing carnival-style fun. Another cherished annual event is the Kerman Christmas Parade, which welcomes Santa Claus to town. A Christmas gift fair is often held before the Christmas Parade and showcases the work of local artisans and food vendors. Outdoor enthusiasts will love exploring the city’s numerous parks. The Kerman Parks and Recreation department runs nearly one dozen recreation facilities including a community/teen center. The area’s lovely Mediterranean climate, means you can enjoy the outdoors almost every day of the year. 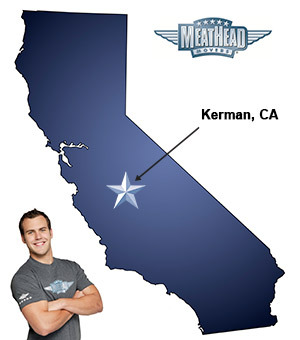 If you’re considering making the move to Fresno County, choosing Meathead Movers is a great way to ensure a smooth move that way you can begin enjoy everything Kerman has to offer right away. Our Kerman movers specialize in local, long-distance, and commercial moves to, from, and within California. We also provide reliable packing, storage, on-site relocations, and our distinctive moving concierge service. All our clean-cut, friendly student athlete Kerman movers study at nearby colleges and are dedicated to providing you with the best and most efficient service possible. In fact, they even jog when not carrying your possessions. We also ensure that the same moving team is with you from start to finish. Moving to Kerman means enjoying a beautiful climate and the best of small-town living. Ensure that your move goes well by choosing Meathead Movers as your Kerman movers. With our 100% satisfaction guarantee, the only thing you have to lose is the stress that comes from moving! So contact us today for a free moving quote and to learn how we can help you on your next move! I am so grateful to Meathead movers for moving a piece of furniture I bought from a friend. It was much to heavy and difficult to maneuver. The professionals at Meathead Movers made wuick work of the project. I would call them again for sure. The services I got from Meathead Movers was excellent. The movers Brandon and Omar were polite and effective with the moving process and I would use again. Very organized. They came in and stayed productive the entire time.